Do you think we can assume that the servicing will be identical to the S1R ? Basically I mean the servicing schedule and what actually needs doing. I believe this is partially correct. The XR uses a cable operated clutch so no fluid involved in the actuation mechanism other than applying grease to each end of the cable. BMW cables are teflon lined so you should not lube the cable length between the end fixtures. The brake fluid flush/bleed is scheduled on the first year of service and then every 2 years after. This is time dependent service regardless of mileage. The 6000 mile service mentions the requirement but remind you the first year it is due. This is according to my well regarded service manager. 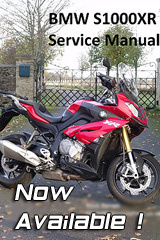 I asked the same question about the first 6000 mile service because every BMW prior has required the first year and then varied on the time after based on year and model. I do all my own service so I wanted to have this detail right.